Before we begin our story: Video of the final project in action can be seen here. The key to successful implementation of this project was moving the pen around on the board exactly as we wished via the Raspberry Pi’s direction. Taking inspiration from 3D printers and laser cutters, we decided on the two rail system diagramed in figure 1, with the addition of a pen holder to control if it drew when it moved or not. The two axes were horizontal, across the top of the whiteboard, and vertical, which moved across the board and moved the pen holder up and down it. The final product closely matches the diagram. Attached, find images of close-up component systems, as well as a picture of the whole whiteboard. The project terminated in a satisfactory state of functionality. Check out the video! https://www.youtube.com/watch?v=Mu4wEebf64k The Etch-A-Whiteboard accurately renders instruction files to trace the edges of images with precise lines. Persistent problems included heat dissipation and logic voltage discrepancies. Figure 1. An initial concept diagram of the Etch-A-Whiteboard’s layout. While all of these files are in the CAD repository, the pictures are still good visual demonstrations. This is a custom MeshMixer support structure superimposed on the autoCAD drawing of the pen holder. The XY interface is one of the most important parts in the entire project. 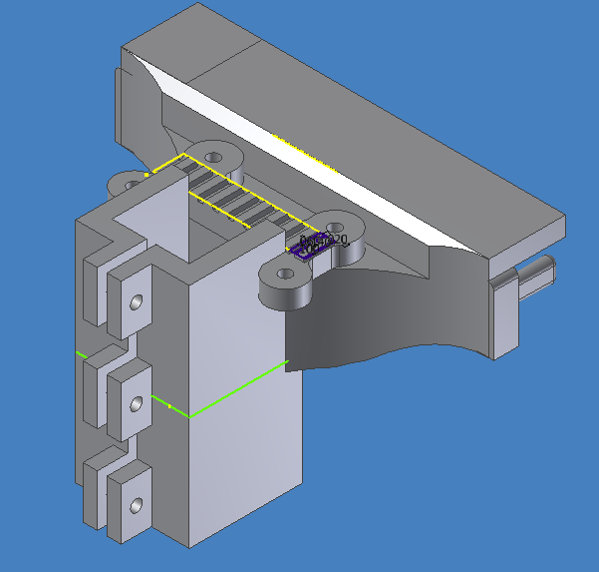 It both provides for stable support for the Y axis, and allows the entire axis to move fluidly along the X axis. Due to the unique nature of the project, almost all components had to be built from scratch. To this end, the CAD softwares AutoCAD, Inventor, MeshMixer, and Eagle were used extensively. Attached are the files used in construction of this project. A simplified diagram of the electronic configuration. findEdges.py uses OpenCV to detect and thin the image's edges, then instructionGenerator.py traces out those edges and turns them into commands for the whiteboard, outputting them into a .eaw file. Movement.py can be used on its own to take one command at a time inline (useful for re-calibration and testing) or as a resource for draw.py, which takes a .eaw file as an argument and executes the instructions therein.